The Simians of Swing are no ordinary jazz group; they are story tellers in the great comic book tradition. Each number on this album is a soundtrack to a hero or villain; some of the characters are good, most are bad … but all are legends with tales of revenge, tragedy and romance. Set in a post-apocalyptic world the Simians narrate their stories through the medium of jazz. Their first Luton gig after 37 years of existence. With support from The Knockouts. This is an external promoter event, and is currently SOLD OUT. Sorry. Outing for dynamic young pianist HEZRON SPRINGER and featuring electric bassist and guitarist DAVE SHANNON and drummer DAN EGAN. Not a typical Jazz set, but Jazz fused with Bossa Nova, Rock, Metal, Salsa, Latin, Contemporary and so much more. If this is your first time watching them you're in for a real treat! In 1988, director Mike Figgis cast 6 members of the legendary free jazz group 'The People Band', to perform in his first feature film ‘Stormy Monday’, which starred Sting, Tommy Lee Jones, Sean Bean and Melanie Griffith. Figgis knew exactly what he was arranging, as he himself had been a People Band member since the late ’60’s. The band was cast in the film as “The Krakow Jazz Ensemble’ a group of touring Polish Jazz musicians. The band; guitarist Ed Deane, saxophonists Davey Payne & Paul Jolly, pianist Mel Davis, bassist Charlie Hart and drummer Terry Day, feature throughout the film performing and playing, including an extreme version of the ’Star Spangled Banner’ (in front of a visibly shocked Jones and Griffith) which caused a stir amongst film goers and notably film critics. Since then the 6 musicians have performed regularly with others as the People Band and this performance at the Bear Club forms part of a planned reunion for the Krakows who will perform alongside pianist Pat Thomas, replacing the late Mel Davis. A special FREE screening of the film will take place early in the evening. Film screening is free for those who can only attend this part. Luton's Paul Jolly (left) in a shot from the film. 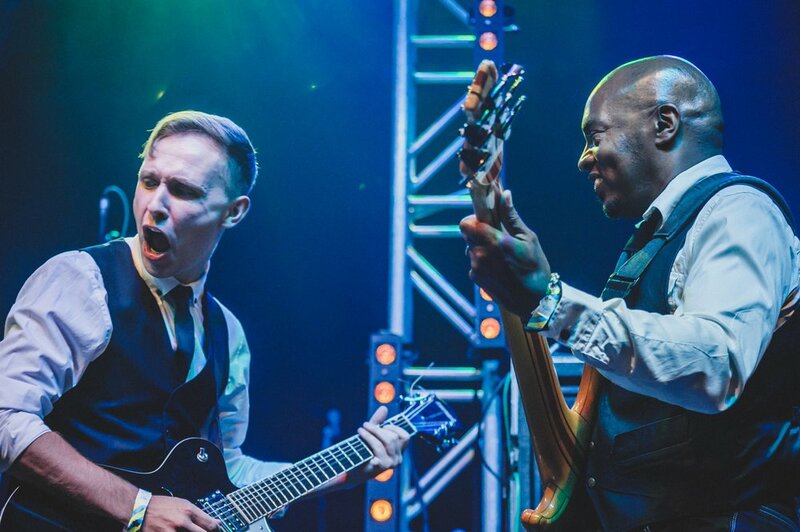 A night of rhythm and blues featuring Greg and his immensely talented outfit featuring Stuart Dixon - Guitar (Dani Wilde/Eddie Floyd/Geno Washington/Marcus Malone), John Thompson - Bass (The Selecter/Bad Manners) and Jay Joseph on drums. A return to The Bear Club after Greg's fantastic show here last year. Critically acclaimed, Clement Regert's Wild Card is a melting-pot of musical ideas, fusing urban rhythms, Hard-bop and grooves with latin and jazz attitude. For tonight’s show they have a stellar line up which comprises of special guest, fiery Alto saxophonist Jim Knight (M.Buble, Cee Lo Green...), backed up by the core Organ trio of Gabor Gornyei on Drums, Andrew Noble on Hammond Organ and French guitarist/band leader Clement Regert. You can expect to hear their famous mix of Afro-jazz, Hard-bop, Samba and raw funk numbers. "Whaoo! What a band! ...You are in for a real treat." BBC "Jazz World show"
“The soul of New Orleans in the UK”, Dom Pipkin has played with everyone in the business, and has a unique relationship with the blues and soul of New Orleans, where he is a regular visitor and performer. Dom breathes new life into the classic funk sounds of The Meters, Dr John, Fats Domino and Professor Longhair with a stellar list of festival and radio and TV appearances including The New Orleans Jazz and Heritage Festival, the London Jazz Festival, and an extended residency at Ronnie Scott’s famous jazz club in London. CLICK HERE TO HEAR DOM ON THE STREETS OF NEW ORLEANS. A hard swinging, heavy punching and intensely creative new jazz quartet. Playing a mix of old songbook standards and new original music. Comprised of top London Jazz students, the lineup is Tom Ridout - Saxophones, Joe Hill - Piano, Joe Dessauer - Drums and Joe Boyle - Bass.